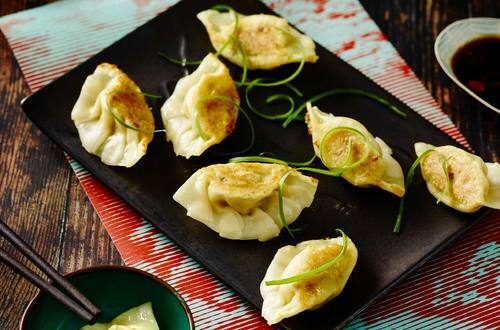 These delicious dumplings have the flavour of Asia all wrapped up! A great finger food idea for your next party, or a great addition to your Asian inspired meal. 1 Combine pork, Recipe Base, spring onions and sesame oil in a bowl and mix well. 2 To make the dumplings, hold a wrapper in one hand and place 1 teaspoon of mixture in the centre. Moisten edges with water and seal to create a parcel. Repeat with remaining wrappers and mixture. 3 Heat a little oil in a non-stick frying pan, add 10 dumplings and fry for 1-2 minutes or until they are brown underneath. Slowly add ½ cup water, cover and cook for a further 3-4 minutes. Transfer to a lined baking tray and keep warm. Carefully wipe out the pan with paper towel then repeat process with remaining dumplings.